Today, we have two articles on CalPERS’ election mess. The first describes what might be deemed a predictable CalPERS screw-up, illustrating yet again how much the institution has fallen in terms of integrity, particularly its bad habit of covering up rather than cleaning up problems. Not only did changes in CalPERS board election procedures approved in 2016 fail to deliver any of the promised benefits, but the 2018 ballot count suffered a major operational failure, and the scramble to remedy it showed how insecure and untrustworthy the process is. The second article describes a far more troubling aspect in depth. CalPERS’ staff jeopardized the confidentiality of beneficiary data and lied to the board and public about its relationship with the company that got the information. We learned, thanks to a Public Records Act request, that CalPERS had a company called Votem Corp. tally the votes for the 2018 election when CalPERS has no legal relationship with Votem whatsoever. CalPERS continued to give the board the impression that the former vendor, Everyone Counts, managed the tabulations, when as we’ll explain longer form in the next post, that was clearly false. Understand how serious this is. CalPERS’ member database was in the hands of an outside party with whom CalPERS had no contract whatsoever, no agreement to maintain confidentiality, no agreement to return the records, and no basis for asserting liability if any of that data was purloined or got out into the wild. The sale of Everyone Counts’ assets to Votem closed on October 1, meaning at the latest at the end of the business day in California (and more likely, before the end of the day Eastern time, since Votem is headquartered in Cleveland, Ohio). The fact that it was a sale of assets and not stock means that Votem did not inherit the Everyone Counts agreement with CalPERS. CalPERS decided to depend on the kindness of strangers. CalPERS effectively operated on a handshake with Votem, hoping that the firm would consider itself to be bound to the terms of the former vendor’s agreement. The election was open until midnight and voters were most assuredly trying to make last minute votes. 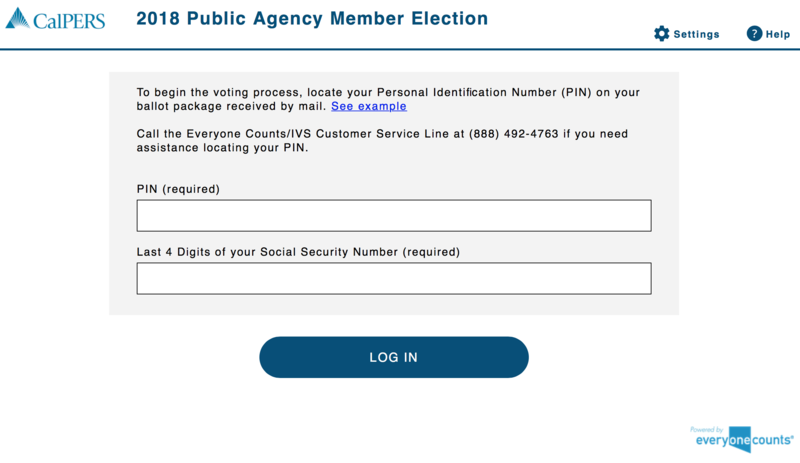 The election vendor had access to the CalPERS member database to conduct the phone election and provide PINs for the Internet channel. Recall that we ascertained in 2017 that Everyone Counts used contractors working out of their homes to field calls from voters. So they weren’t running a very tight ship from a information security standpoint. The tally wasn’t completed until October 4, which means it is very likely that Votem had access to the member database for days if not longer with no confidentiality obligation and no legal recourse for CalPERS. And as we’ll discuss in the second post, CalPERS still has no contract with Votem. 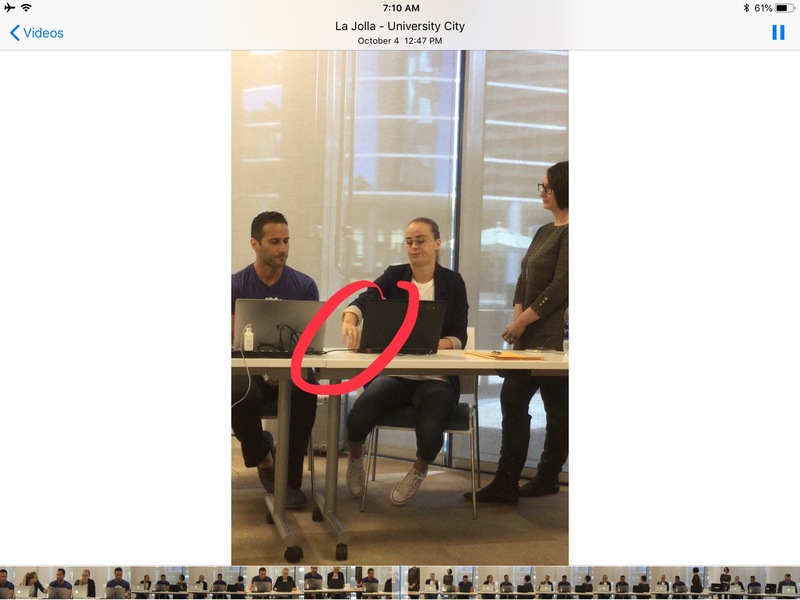 Letting Votem handle such a sensitive task with no contract meant CaLPERS had no recourse in the event of misconduct and screw-ups, which as we’ll show in this post, happened. It also means that CalPERS is certain to have made misrepresentations to the Secretary of State, who certified the election. CalPERS would either depicted its former vendor, Everyone Counts, Inc, a company that was defunct, as being responsible for and presenting the vote tally, when that was impossible. Or it would have falsely presented Votem as having been authorized to make the count, when it had no legal authority to do so. On top of that, CalPERS did not have the old agreement signed over to Votem as of January 8, and we’ll explain in the next post why that can’t happen. Nor from what we can see on CalPERS “bid opportunities” log, is it looking to hire election vendors, which is what it would have to do it if were to enter into new agreements with K&H Printing (which made an agreement with Everyone Counts, with K&H confusingly using the name of Integrity Voting Systems, to fulfill the 2016 CaPERS election contract) and Votem. CalPERS not only sought to mislead the board and public about who handled the 2018 election, it is going into the 2019 election with no contract in place and no realistic process to get one signed by the time the board is scheduled to approve this year’s election process at its February board meeting. This is a fiasco of epic proportions, and it is not an idle issue. Potted plant Board member Henry Jones’ term expires in January 2020 and we understand from retiree groups that there are candidates who will challenge him this year. The fact that insurgent candidate Jason Perez won in 2018 is no great cause for comfort. Despite CalPERS’ considerable promotion of its audit-trail-free Internet voting, over 60% of the votes cast were by paper ballots which could be recounted. That greatly constrained the opportunity for mischief. Going from a secret paper mail-in ballot to non-secret paper ballots. Previously, the required voter signature certifying the vote and the bar code associated with each voter were on the mailing envelope, which would be separated from the marked ballot at the time of processing. The new procedures had the bar code and signature on the ballot, making it possible at any point in time to identify how a CalPERS member had voted. These non-secret ballots sit in a warehouse even today, and union officials or employers might be able to access them to find out and punish individuals who cast votes for the “wrong” candidate. Implementing voting by phone and voting by Internet. CalPERS implemented both methods even though both are explicitly illegal for California elections, per the California Election Code § 19205. CalPERS has argued that it can set its own election methods and ignore the California election code. CalPERS staff claimed that the reason for the changes were to increase participation, which has always been very low, and to reduce cost. However, there were other motives at work. Until the 1994 board election, the unions were able to exercise a great deal of influence over the vote. Ballots were distributed at work, either by the shop steward or with the steward close on the heels of the responsible party, telling voters who they should pick..
A court ruling invalidated this procedure and forced CalPERS to implement mail-in ballots. Operations Support Services Division Chief Kim Malm: At this time, I’d like to take a minute of personal privilege, Mr. Chair. I’d like to thank the staff that have worked really hard on this over the last couple of years. Anthony Martin, Christina Nutley, Nina Dinsdale, and Dallas Stone from my staff. Also Erin Lopez and Renee Salazar from the Legal Office, and also Public Affairs. We would not have been able to do this without them, in addition to the constituents that have been extremely supportive over the last couple of years. And especially Dave Lowe and Terry Brennand who kind of got this in front of some people – important people to help us push this forward. Dave Low and Terry Brennand are the two big union power brokers at CalPERS. Until recently, Low was the Executive Director and chief lobbyist of the California School Employees Association. Brennand is the Director of Revenue, Budget, and Pensions, SEIU California. 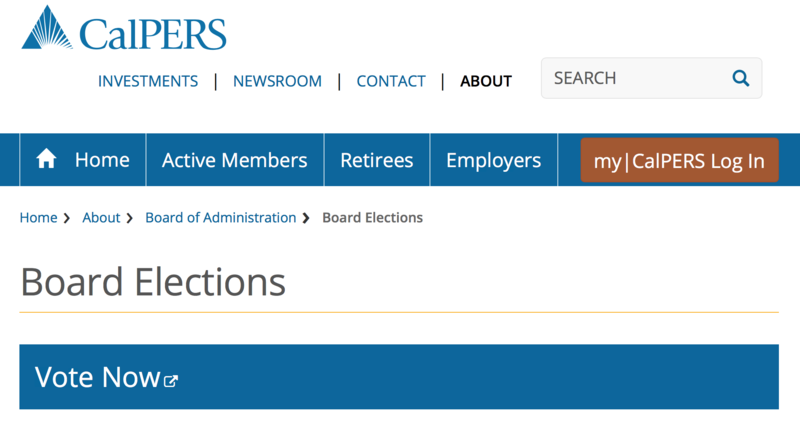 Why, pray tell, are the unions meddling in how CalPERS conducts its elections? CalPERS’ CEO Marcie Frost has said she wants to eliminate paper balloting entirely. The justification, that this would save costs, is a convenient cover for the real aim, that of suppressing votes by retirees, who have a higher level of election participation, and have also been strong supporter of board members who have the temerity to ask questions and demand accountability, like Margaret Brown and former board member JJ Jelincic. In other words, even before you get to the opportunity to engage in nefarious conduct, the motive is to give the unions even more sway over the board. Even worse, the vendor responsible for the Internet voting, Everyone Counts, did not generate a paper trail for its vote, a bare minimum requirement for verifying accuracy. Cynics might think they were chosen for the ease of tampering with results and not getting caught. As we chronicled at length last year, then candidate Margaret Brown visited one of the two election vendors, K&H Printing, which has a sideline under a “doing business as” it calls Integrity Voting Systems. K&H was printing and mailing the paper ballots, and also receiving mailed ballots and scanning them. Brown observed many irregularities, such as the ballots not being held securely in cages, and instead being in a room to which pretty much anyone had access (one door opened directly on to the parking lot) and being opened and scanned each day, rather than at the end of the voting, as was legally required. 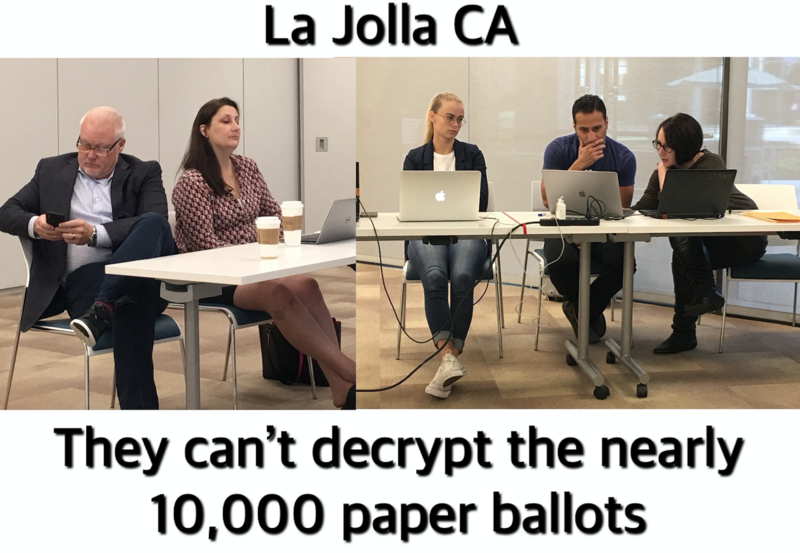 After a huge outcry over these and other election deficiencies, CalPERS made only minimal changes to its election process, that of getting rid of the clearly-illegal non-secret paper ballots, where it was possible to determine which vote beneficiaries submitted. That is a clear-cut violation of the California constitutional requirement that “Voting shall be secret”. CalPERS went back to its former approach of having the bar code and voter signature on the envelope, separate from the ballot on which they marked their choice. Voter turnout for the 2018 Public Agency Member election was 6.4%…..In comparison, the voter turnout for the 2014 Public Agency Member election was 6.8%. Oops. And the same report describes CalPERS’ “voter outreach” methods. The absolute number of votes fell too, despite the number of eligible voters having increased slightly. Recall that last year, Jason Perez challenged incumbent Priya Mathur. On the merits, this election should have attracted more interest than the last time Priya faced voters. First, in 2014, Mathur was up against a lackluster opponent, an advocate of pension “reform” which means cutting benefits. This time, Mathur had been involved in questionable behavior, such as censuring fellow board member Margaret Brown and denying her access to her mail, failing to stop the process of board members illegally pre-signing expense claim form in blank until this blog made a stink about it, and forcefully defending former CFO Charles Asubonten and CEO Marcie Frost when they were shown to have made major misrepresentations during the hiring process (and in Frost’s case, after she joined CalPERS). Challenger Perez had also gotten some press, such as for calling out CalPERS Treasurer John Chiang for pushing for gun-related divestments as a stunt to boost his gubernatorial bid. Despite these controversies, which should have sparked voter interest, fewer participated. And we aren’t exaggerating when we say that CalPERS is pushing the most tamper-friendly method hard. The 2018 voting period ended on October 1. 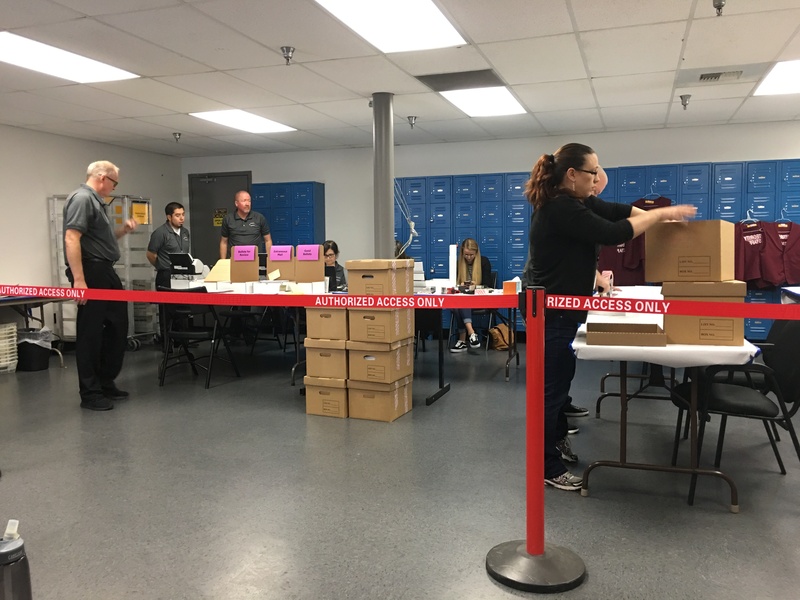 On October 2, envelopes containing paper ballots were opened and scanned at K&H Printing facility in its Everett, Washington facility. On the date specified in the Notice of Election at the location designated by CalPERS, the validated paper ballots shall be tabulated publicly by an independent, neutral agent appointed by CalPERS for that purpose. 1. The paper ballots are to be “tabulated”. That means the ballots proper, not scanned images. 2. The tabulation was to be done “publicly”. Yet no member of the public was able to see what software was used and how it made the computation. 3. The date is a “date specified,” meaning one and only one date in the the Notice of Election. And that date was 9:00 AM on October 2. CalPERS violated its own rules by changing the date to October 4. Why the delay? More on that in our next post. Contrast CalPERS’ idea of what a public count looks like…. And that’s before the public having no way to be sure that the scanned ballots from Everett weren’t tampered with or didn’t become corrupted on their way to La Jolla, California,4 where the phony public tabulation was to take place. 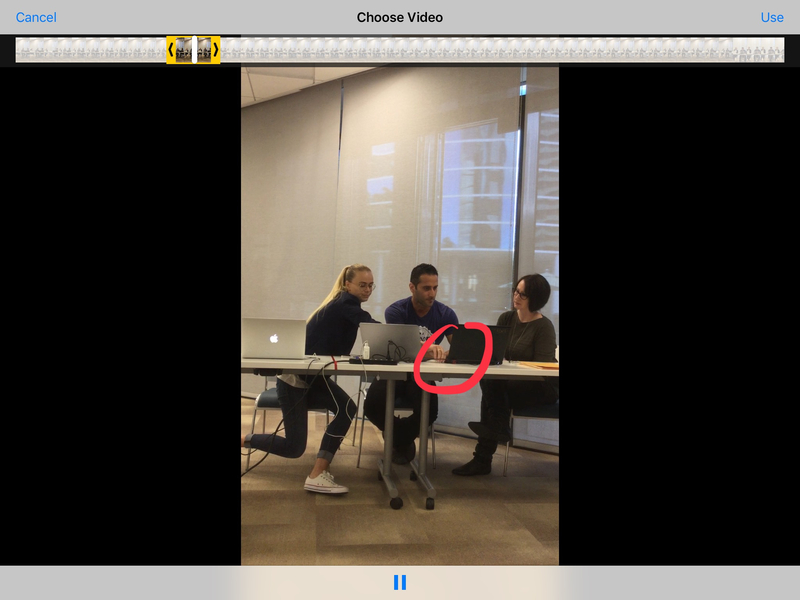 And if you look at this video clip, T-Shirt Guy looks to be in charge of trying to open the files. You then see, at about 1:14, Blond Woman reach across and install a USB stick on her computer. Not long after that, both T-Shirt Guy and Brunette Woman are looking at Blond Woman’s scrreen, when they had been focused on what T-Shirt Guy was trying to do before (there are more video clips that show T-Shirt Guy as the earlier center of the action). CalPERS almost certainly never would have admitted to this train wreck had board member Margaret Brown and another observer not been there. CalPERS predictably underplayed the mess in the report to the board (the language was approved by CalPERS), as you can see from the embedded document at the end of this post. The 2018 CalPERS Public Agency Member Election was conducted by the Everyone Counts/IVS Joint Venture. Everyone Counts has since been acquired by Votem, Corp. The election team and tabulation platform remained the same. First, the election vendors admitted in 2017 (just the way CalPERS finally confessed that “CalPERS Direct” was not direct investing) that its election “joint venture” was no such thing. It was an operating agreement between K&H Printers-Lithographers, Incorporated, dba Integrity Voting Systems, and Everyone Counts, Inc.6 In keeping, the two parties signed the agreement as separate entities. Second, the parties nevertheless attempted to depict the contract repeatedly as a joint venture, even stating in the operating agreement that the services were to be provided in the name of the ““IVS/Everyone Counts Joint Venture”. So Votem also misrepresented the name by putting “Everyone Counts” first, implying it is the more important player. We have the agreement embedded at the end of our second post. It makes very clear that K&H Printing, operating as IVS, was the dominant party. Third, Votem falsely stated that the elections were conducted by the soi disant joint venture. That is false because Everyone Counts defaulted on the agreement by selling its assets to Votem before the election was over. Fourth, Votem says it acquired “Everyone Counts”. It did not do so. It acquired only Everyone Counts’ assets, deliberately leaving the liabilities and the legal entity behind. Finally, Votem claims that it acquired “Everyone Counts” after the election. This is false, since the sale of assets closed before the election was over and days before the tabulation took place. But it’s not hard to see why CalPERS would entertain doing business with Votem. They lie as easily and badly as CalPERS’ staff. 1 This would appear to be a violation of the California constitution requirement that “Voting shall be secret,” but the Supreme Court has ruled that voters can bring someone with them into the ballot booth (in the days of mechanical voting machines with curtains) to “assist” them if they needed assistance (as in had vision problems or other disabilities). Clearly this is a big stretch of what “assistance” amounts to. 2 There were many complaints this year and last year about the difficulty of getting through on the phone; I experienced over 15 minute waits the two times I tried. 3 This didn’t work as well as planned since voters needed a PIN to vote by phone or online. Those PINs were sent with the ballots, begging the question of why would anyone vote online if they had located their PIN in the mailed materials. At that point, filling in the simple ballot cards and signing the envelopes would be easier than going to the site and figuring out how to navigate it, or dealing with the cumbersome phone system (see here to see the horrible and confusing script). Voters could also get a PIN by phone, but see Footnote 2 above. They proved to be not so easy to obtain. 4 Well, members of the public could ask for a recount to make sure the numbers squared, but who would bother to do that as a matter of principle? 5 The clip we provided from the 2017 snap election gives only a snippet of the process. Ballot boxes are conveyed by hand, in full view of many election volunteers, and often cameras, to the counting places, which are typically gymnasiums of public schools. There the opening and count of the ballots is totally in the open, with lots of people standing right over the folks at the table handling the ballots. To add insult to injury, the election coordinator’s message is dishonest by depicting Integrity Voting Systems and Everyone Counts as one business. They aren’t. They have not formed a joint venture and when pressed by Mike Flaherman in the September 20 meeting, they said instead that they had entered into an operating agreement for the CalPERS election. Consistent with that, the embedded “Notice to Award Contract” clearly shows that the contract was awarded to two companies, not one, and that Everyone Counts, and not IVS, is in Ja Jolla…..CalPERS apparently thinks this obfuscation is necessary since it told the board that only IVS was its new election vendor, and also falsely said that IVS was certified by the Secretary of State. In fact, K&H Printing is certified only to do printing and finishing of certain types of election ballots. IVS does not have any certifications in California. Great reporting here, but how can you be so surprised at this? Gross incompetence, casual lying, cover-ups, and hand-washing of oversight by constitutional fiduciaries are how we do things here in California, the Golden State! From our founding legend of the Gold Rush through the frothy bubble that is Silicon Valley, cons and manias are our brand. Our favored sons and daughters (some adopted) like Richard Nixon, Ronald Reagan, Charles Keating, Michael Milkin, Angelo Mozillo, and Elizabeth Holmes have proven that California continues to be the Best of All Possible Worlds! CalPERS should use paper ballots and count them. Simple to implement and easy to do a recount. Why can’t CalPERS just do what is best? 1. The fact that it was a sale of assets and not stock means that Votem did not inherit the Everyone Counts agreement with CalPERS. CalPERS decided to depend on the kindness of strangers. CalPERS effectively operated on a handshake with Votem, hoping that the firm would consider itself to be bound to the terms of the former vendor’s agreement. No contract, so no breach of contract or failure to perform liability, a get-out-of-legal-liability-free card; another example of CalPERS’ professional due diligence toward protecting its members interests. Oy. 2.The tally wasn’t completed until October 4, which means it is very likely that Votem had access to the member database for days if not longer with no confidentiality obligation and no legal recourse for CalPERS. And Votem could also be keeping a running tally of votes inhouse during the open vote period. Now why might that be useful? 3.Now the point is not that the people here actually did a switcheroo of the flash drive, but that the entire process was so badly run that that could easily have taken place. Theres nothing dimly approaching the sort of public oversight of the process that is routine in places that care about election integrity like the UK. Thanks for your continued reporting on CalPERS, pension, and PE. CalPERS almost certainly never would have admitted to this train wreck had board member Margaret Brown and another observer not been there. Three cheers for Margaret Brown and the other observer. To be clear: Votem was running the election only from when its deal closed during the day on October 1 to the end of October 1, as in midnight Pacific. So the concern in #2 isn’t operative. At most, the party keeping a running tally on votes prior to close of the election could have done so only for votes submitted by phone and Internet, since Margaret Brown went to Washington and saw the ballot envelopes opened and the ballot cards removed and tabulated on October 2. And if a running tally of the votes on the phone and Internet channels was being made and given to CalPERS (would have to be done by phone to evade Public Record Act requirements), it would have been done by Everyone Counts during the election. This is all unbelievable stuff. I would go through the specifics of a criticism in what they are doing but I sometimes wonder what the point would be. Its like a race between stupidity and culpability with each pacing the other. If CalPERS wants to save money, they can send their votes to me instead of Votem Corp. and I will count and return the vote numbers. The results will be, like a lawyer’s version of reality, whatever they will want it to be. I could use the cash. I have a proposal here. Californians already are familiar with the Richter magnitude scale for earthquakes because of where they live so perhaps they could get used to another scale – that of Stupidity because of where they live. At the bottom of the scale you could have 1.0 representing Ignorance. Then as you go up the scale you would go through 2.0 Foolishness, 3.0 Dull-wittedness, 4.0 Lunacy, 5.0 Brainlessness, 6.0 Mindlessness, 7.0 Stupidity all the way through to Idiocy at 8.0. This would, like the Richter scale, be capped off with anything at 9.0 or greater as a CalPERS event. Last I heard the CalPERS Board was trying to get the Sacramento City Council to change the name of the street where their Headquarters is located from Q Street to Mos Eisley Boulevard. That’s Spanish, isn’t it? Attorney General Becerra is going to be all over this! With the new Governor going in – does he get to select his own Attorney General or is he bound to let Becerra finish his term? In California the AG is an independent constitutional elected official. Xavier Becerra was a member of Congress angling for a role in the Clinton administration. His Bar license had been in “inactive” status for 20 years when Brown appointed him; now he has been elected to the job. Thanks for that clarification. Did not know what his status was under the new leadership. Rev, Becerra’s job is to go along and get along without ruffling any important feathers.